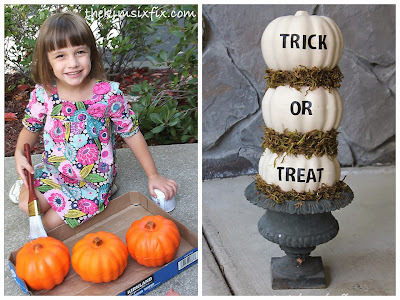 Welcome to Day 4 of “Dollar Store Pumpkin Makeover” Week! And since this is Flashback Friday, I thought I would revive the post that started it all. The granddaddy of dollar store pumpkin makeovers: My Trick Or Treat Pumpkin Topiary. If you would like the detailed steps of how we did it, you can view that original post. In case you are curious, I've stored this topiary (off it's base) for a full year and I took it out earlier this week. It is still in good shape. I was surprised to be honest, I thought the moss would fall off and detiorate, but it didn't. I may take off those words and try something new this year.. but you'll just have to wait and see. Until then, make sure to check in over the weekend. I don’t normally post on Saturdays and Sundays, but for this big event I have 2 more pumpkin makeovers coming up.